It is based strictly on the rules of Towers of Hanoi, a well-known problem in the Computer Science world. You begin with three pegs, and a number of stones of varying sizes. The goal is to move all stones from the first peg to the third, by picking up a stone at once and under the constraint that a stone cannot be place on top of a smaller one. 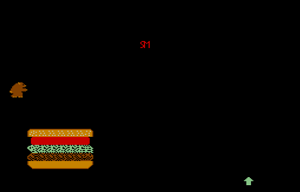 In Burgers of Hanoi, Burly the bear returns, and he has to move a hamburger, ingredient by ingredient, to the spot marked with an arrow. 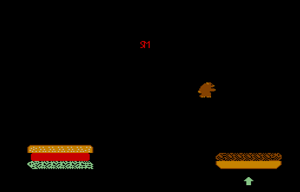 The catch is that they must be kept in the same order, just like for the original game. You better not put the meat on top of the lettuce, or anything else crazy like that!